The Connecticut Mercantile and Retail - Minors is a child labor law poster by the Connecticut Department Of Labor. This poster is mandatory for some employers, including employers of minors who are in mercantile trade or retail. This poster must be posted in a conspicuous place where all minor employees will see it that are in the mercantile trade or retail industry. This poster describes minimum wages that must be paid to regular minor workers as well as minor handicapped workers and restrictions on when minors can work. This poster also describes penalties to employers for violating this law. It appears you don't have a PDF plugin for this browser. 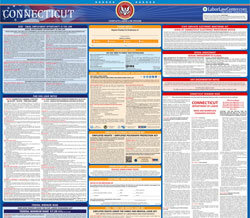 Please see the link below to download connecticut-poster-minorsretail.pdf. -  No more than 6 hours per day/32 hours per week/6 days per week. a school day (normally Friday, Saturday or Sunday). -  8 hours per day/48 hours per week - no more than 6 days per week. are subject to the non-school week restrictions. through Labor Day, when evening hours may be extended until 9 p.m.
only until 7 p.m. for no longer than 8 hours during the school year. over the age of fourteen who has been placed on vocatio nal parole by the Commissioner of Children and Families. provisions of chapter 54, as the commissioner deems necessary to implement the provisions of this subsection. hours to the inspectors of the Labor Department. the twenty-fifth day of December of such year. program or school-to-work program shall not be counted against the daily or weekly limits set forth in this section. may be discharged or discriminated against in any manner for refusing to work later than ten o'clock in the evening. thousand dollars or imprisoned not more th an five years, or both, for each offense. a civil penalty of three hundred dollars fo r each violation of said chapters and for each violation of subsection (g) of sectio n 31-288. Department for a civil penalty of six hundred dollars for each violation of said sections.